How are everyone’s little ponies coming? I figured I would give you a few days to finish up the major sewing before we started adding the extras. But I’ve found a few minutes this morning, so I figured it’s finally time to discuss your cutie mark options. Please keep in mind that I haven’t actually tried all of these methods, but conceivably they should still work. You may have already seen that this is my new favorite option. I absolutely adore these embroideries by E the Pony, and will definitely be purchasing my own embroidery machine in the near future! If you happen to own one already, you can find cutie mark pes files on his blog (here is Rainbow Dash since she seems to be most popular) or purchase the entire set of 25+ cutie marks. If you don’t have an embroidery machine, but still love this look, you can always order a patch instead. They’re just as cute! This one is pretty self explanatory. If you aren’t already a master at satin stitch, (I’m definitely not!) I’d suggest shooting for an outline instead of a filled in version of your cutie mark. The options are pretty endless with embroidery though. I painted the lightning-cloud onto a plain piece of white cotton with Tulip fabric paints, cut it out, and then stitched it onto the pants. I know this isn’t for everyone, but it isn’t as hard as you think if you just print out an image of the mark you’re making and trace it first. 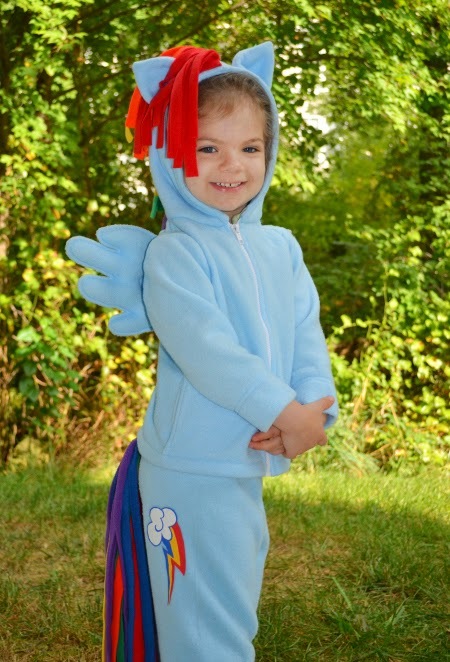 Jess over at CINO shared great instruction on how to do this when she made her Rainbow Dash tutorial last year. But I’ve found references from a few people around the web saying they have been able to pull it off. I’m sure if you have a silhouette to cut all those little shapes out it would be a major time saver, but since I don’t I’m gonna have to rely of some of you guys to do the experimenting for me. If anyone all ready has the supplies and would like to test one of these methods on a piece of scrap fabric, I’d love to hear about the results. Please do not try this on your actual pants without testing first though! Also, make sure you start with your iron on the lowest setting, and use a press cloth so you don’t accidently ruin your iron with melted fleece! 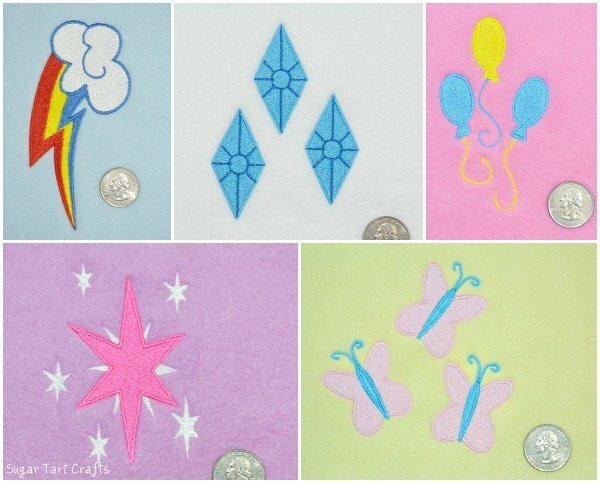 If you have any other ideas about how to make cutie marks, please feel free to share them in the comments. I’ve only covered the first few that came to mind, but there are probably many more ways out there! Thank you so much! I am following along and I cannot wait for your last post… my daughter is being Princess Twilight Sparkle and I'm intrigued to see how you handle the bangs. You have made my daughter's Halloween! You're very welcome Penny! The last post for the bangs is up and ready to go. I sure hope you'll share a picture of your final costume! 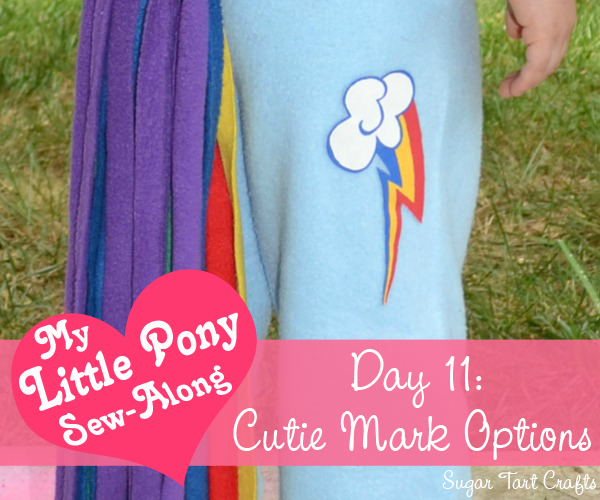 Another way to make a cutie mark would be to either print it out or cut it out of paper, and use modge podge fabric to attach it to the pants. However it might make the fabric very stiff in that area. Great ideas! I'm curious if the puffy paint would come off in the wash though. I have a heck of a time with it peeling off t-shirts, but I wonder if it would latch on better to the "fuzz" of the fleece. It seems to stick pretty well on the fleece. I made my daughter one and all I had was puffy paint. The fleece seems to absorb the paint which seems to help! Thanks for the info Samantha! That sounds like a good option. I'll have to run some tests. I wanted to thank you for all these tutorials! I am not a great seamstress, but you made it so easy to do the accessories for my daughter's Halloween costume. She, of course, did not want any of the ponies with pre-made costumes, but had to be Princess Luna (which means a horn, wings, the whole shebang. Because I don't sew well, I bought a long sleeve shirt and some leggings and a tutu in the correct color (about $20 total), which I am embellishing with the ears, horn, wings, tail and cutie marks. So far it's looking really great and my daughter is so excited. Thank you so much, again! My daughter is being Fluttershy for Halloween and I made the cutie mark with pink fleece and fusible web. I used a press cloth so the iron did not directly touch the fleece and lots of steam and it came out great! I plan to do the middle of the butterflies with blue fabric paint.